The Strategic Release Framework for Coal and Petroleum Exploration (the Framework) has been developed by the NSW Government to deliver greater transparency and control over the release of exploration areas and the granting of prospecting titles for coal and petroleum resources. It sets out a process for achieving value for the economy and adequate returns for state owned resources. The Framework recognises there are competing uses for land, and seeks to balance these interests. Areas will be released for exploration only after environmental, social and economic factors have been considered and the community has had an opportunity to identify its values and issues. This will facilitate the safe and sustainable development of resources under a process that balances the needs of the community, the economy and the environment. The Framework implements a transparent and strengthened selection process for issuing coal and petroleum prospecting titles through the up-front consideration of geological, social, environmental and economic factors, and operator suitability and capability. Overseeing and advising on the implementation of the Framework is the Advisory Body for Strategic Release (Advisory Body). The Advisory Body is an interagency group, with an independent Chair. The Advisory Body makes recommendations to the Minister for Resources on the areas to be released for exploration. A Resource Assessment, to be conducted by the Division of Resources and Geoscience, to determine the potential for discovery of a resource of sufficient quality and size to support a stand-alone operation. Based on the Resource Assessment findings, the Advisory Body will determine what, if any areas should progress to a Preliminary Regional Issues Assessment (PRIA). The PRIA, to be conducted by the Department of Planning and Environment, will assess the economic, environmental and social outcomes and will include a community engagement and consultation. The Resource Assessment combined with the PRIA will deliver an understanding of issues that may arise for prospective mining developments. Based on these findings, the Advisory Body will make recommendations to the Minister for Resources as to area/s, if any, to progress to release. Once a decision has been made to release an area, a notice (the invitation) will be published in the Government Gazette (legislated requirement) and through media channels. Applicants that meet the prequalification criteria will progress into the auction and be required to submit a work program and a bid price. A reserve price, based on recovery of the state’s costs in assessing and releasing the area, will be set for the auction. The reserve price will not be disclosed at this point. If the reserve price is met, the applicant with the highest bid will be considered for the granting of the prospecting title. If the reserve price is not met, a second auction will take place where the reserve price will be disclosed to all pre-qualified bidders. To further assist explorers, landholders and the community to understand the Framework, the Division of Resources and Geoscience has developed a Strategic Release Framework Fact Sheet. It is important to note that no part of this process will replace the need for a development application if a project seeks to progress to production. Nor will it duplicate or pre-empt the outcome of any future development assessment. If an explorer is granted an exploration licence and is successful in discovering an economic coal, oil or gas resource they will need to apply for a mining lease (for coal) or petroleum production lease and undergo a stringent, rigorous and exhaustive assessment process, including a detailed environmental impact assessment and extensive public consultation, prior to such a lease being granted. 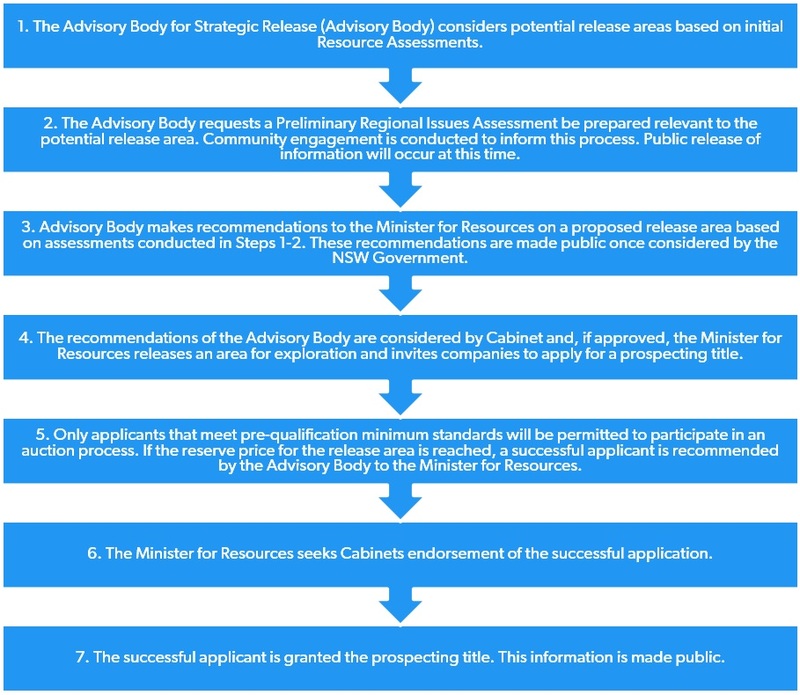 The Advisory Body for Strategic Release (Advisory Body) is the body charged with overseeing the whole of Government assessments, required by the Framework, and making recommendations to the Minister for Resources. Areas to be released for exploration. This will be based on a preliminary assessment of potential areas including community engagement. Auction price. The Advisory Body will recommend the most appropriate competitive auction price for each release area. The frequency of operation of the framework, based on a range of matters noting these will differ between coal and petroleum. NSW Department of Premier and Cabinet. the outcomes of the public consultations undertaken by the Coal Exploration Steering Group. the NSW Gas Plan, which was released in November 2014 in response to the recommendations of the NSW Chief Scientist and Engineer on Coal Seam Gas (CSG) activities in NSW. Call on 1300 305 695. If English isn’t your first language, please call 131 450. Ask for an interpreter in your language and then request to be connected to our Information Centre on 1300 305 695.